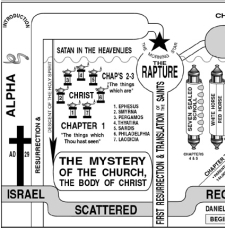 When one allows God himself to interpret the meaning of his prophecies through later revelation, it becomes impossible to employ a naturalistic, Dispensational hermeneutic. Dispensationalists claim to have a literal hermeneutic, taking prophecies in a simple, material sense unless the immediate context demands otherwise. The problem with this approach is that it arrives at interpretations which are later contradicted by the New Testament. In opposition to this principle, Covenant Theologians recognize the validity of “the analogy of faith,” that is, that the best interpreter of scriptures is other scriptures. The hermeneutic which allows the Author to foreshadow spiritual realities through physical means, and later interpret them in clear, didactic writing, is actually a more natural and literal hermeneutic than one which demands a physical/material sense unless an immediate absurdity arises thereby, even when other scriptures contradict this physical/material sense. The basic question is this: will our hermeneutic allow God to explain himself, or will it allow our own human understanding of what is more literal to negate the interpretation of God himself?